Though Ibex Moon is a fairly new project — this is their only release other than a 2016 EP — its members KRIEGOD (vocals) JIAK (everything else) have deep roots in the Chinese metal scene, with previous stints in 2008-formed Skeletal Augury and 18-year-old Beijing Black Metal unit Evilthorn on their collective resumé. Ex-Evilthorn member Li Chao (today better known as alt-club terrorizer Zaliva-D) gets a shout in the liner notes to Past/Evil, which was released by a label that will be familiar to anyone with even a passing knowledge of Chinese metal: Pest Productions. Past/Evil is, in fact, Pest’s 206th release. The label was formed by Deng Zhang from the southern-central city of Nanchang, who first came into contact with the genre as a teenager. 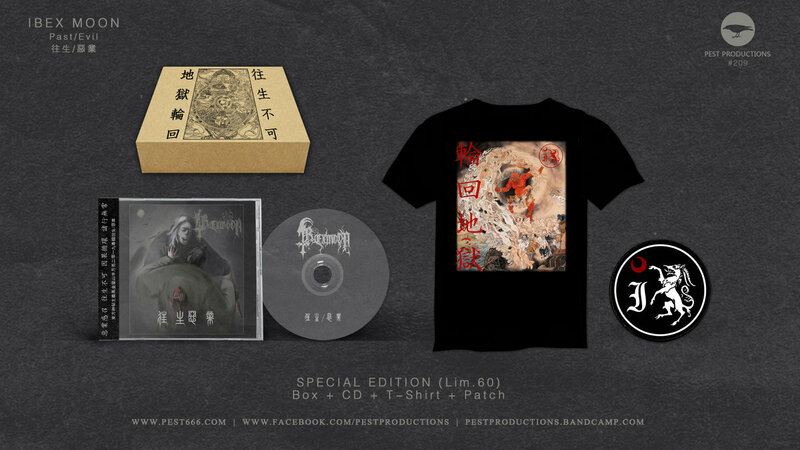 Initially sucked in by overseas influences like New Jersey 80s thrash band Overkill and the homegrown example of early Chinese metal standard bearers Tang Dynasty, Deng launched Pest in 2006 to release a demo for Nanchang Black Metallers Be Persecuted. The rest is a history that’s still being written, one collector’s box set at a time. While Deng’s label represents several tips of the extreme metal family tree, he professes a particular fondness for the “cold and evil voice” of Black Metal, and has done a lot to bolster one of China’s most successful Black Metal bands, Zuriaake. “As far as the Black Metal scene [in China] is concerned,” he says, “there are a lot of young and great new bands in recent years.” Deng lists R.N.V., Fujian’s Black Reaper, Throat Cutter from Taiyuan, Holokastrial from Shanghai, and Infested Crucifix from Nanjing) as a few examples. If you want to dive deeper down the Chinese Black Metal rabbit hole, Deng also recommends southern Chinese Black Metal band Holyarrow’s 2016 concept album about Ming Dynasty prince Koxinga‘s military campaign against northern Manchu invaders (the entire album is sung in the regional language Hokkien), and, naturally, one of his own bands, Dopamine. Of course, this is only the tip of a very large, very cold iceberg: peruse the full library of Pest Productions’ 200+ releases right here, and keep track on their latest limited merch runs via Facebook.